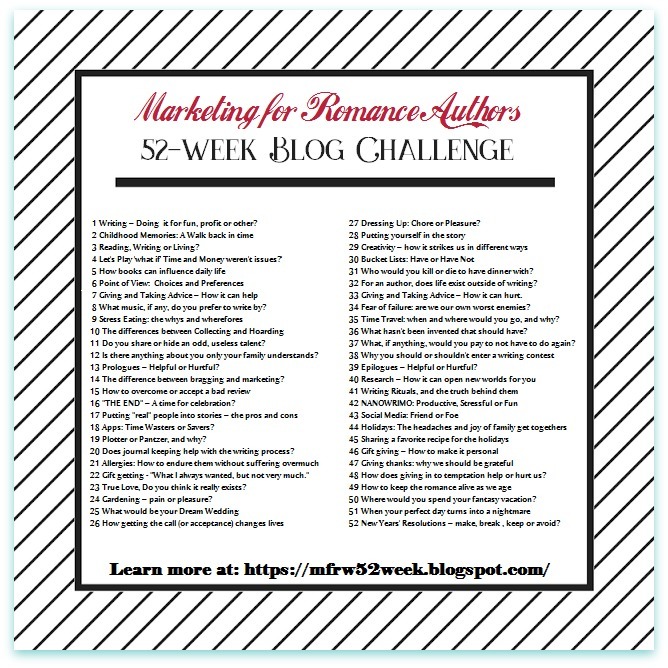 #MFRWauthor 52 Week Blog Challenge Blog Hop. I wasn’t in the mood to do this post this week, but I’m trying to keep up with the 52 Week Challenge, though I have missed posting some weeks and I’ll probably miss again. This topic is important to me. WHY I WRITE. I jotted down a few thoughts during the week, and decided I had a post. I’m still nearly incapacitated from a hip/back injury, but luckily sitting is not too bad, and I’m trying to rest it to see if it improves. It’s been a week with no improvement. Life still has to go on. My dog still has to be fed and be taken out. I’m doing the best I can. This should be easy for me because I’ve been doing it for so long, but I had to sit and really think about it. There are many reasons I write. I’ll list them in no particular order. Stories and characters live in my head. I write to get the stories out of my head. Oher writers understand. If you’re a reader, think of the book you’re reading now—or one you love to read over and over as if you are living it. Are those characters in your mind calling you back to finish the story? Do you picture the setting? Think of what happens next? While you’re busy during the day, do you wish you could get back to it? Well, imagine you are the person who created that story and have lived with that setting and those characters day in and day out, hour after hour, to guide them on their journey for sometimes a year or more. Not to mention these characters don’t sleep much. This one is an important reason for me—I write for the readers waiting for the next book and for the readers who tell me to keep writing. Believe me, readers, I wish I could write faster for you. I write because I like to spend time with my characters and the settings I’ve created. It’s true! I miss my characters after I’ve published the book. Self-satisfaction. Sure, I hire editors, a formatter, and a cover designer, but I get self-satisfaction from having the power over creating a complete book. I write to survive financially. This is true. Without my book royalties, I wouldn’t be able to survive on my own, and there is no one I have to live with. In fact, my rent will jump thirty dollars in August. Ouch. Good thing I write because I can’t not write. Thanks for reading another post for the Blog Hop. 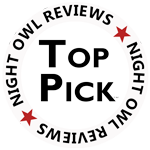 Jump on over to see why the other authors write. Are there similarities between us? For some reason I can no longer paste the whole list into my blog. Please CLICK HERE. Thanks! I think you’re doing a great job of keeping up with the challenge, Mary. Especially if you consider how badly WordPress is messing with some of us… I don’t get any notifications at all, and no way to re-start them. They have made it impossible for me to keep up with everyone. Anyway, just keep writing. Thank you for the positive vibes. I’m happy you visited, Catherine. Happy writing! I agree, writing to get the story out is important. Otherwise the characters keep nagging at you until they are heard. So it’s something I can relate too. I’ve not been in the habit of writing every day. It’s something I’ve gotten into this year and it’s helped. I don’t always work on my WIP but I write something each day. I’ve learned the more I do, the more insistent my characters get. It’s like they know. I’m with you – I miss my characters when I’m done writing their stories. Feel better soon! I know, Robin. It’s like seeing the end of a good movie, and you don’t want to get up to leave the theater until you’ve had time to think about what just happened. Thank you for your “feeling better” wishes. I hope you heal quickly! I also relate- those characters want out of my head onto the page. Enjoyed your post! Thank you, Maureen. I just started writing a new book. I don’t know the characters that well yet, but they’re already calling to me, which is a good sign! Heal quickly. I too miss my characters when a story is done. Hi, Mary. Sorry to hear about your injury 😦 I hope the pain decreases really soon but I’m glad to know you’re self-sufficient as a writer! My goal is the same. I enjoyed reading your post since it is very much like my own life. Thank you for sharing. Much appreciated, Raine. Thank you. I see so many of us have the same reasons and same goals for why we write. It’s exciting! Thank you for visiting today. You’re so write, M.J. Those characters in our heads can be persistent, and they don’t sleep much. Hope your back and hip feel better soon. Unlike a lot of writers I CAN imagine not writing. I’m a musician on the side, and what is unthinkable is no longer playing in a symphony . . . but there’s an excellent chance I’m kidding myself and I’d go crazy(er) if I stopped writing. Take care of that back, Mary! Thank you. I can understand you wanting your music as much as a writer would want their writing, but you are both, Ed, so I bet you have to balance it out. Whether it’s music, photography, or whatever creative endeavor creatives have, I’m sure it calls to them/us. Enjoy your weekend. I think most writers can relate, Mary. I have that sense of “missing” too when I don’t open the laptop for a day. The draw of stories and characters is like an addiction and we need our fixes. Sending you lots of healing light for your back. Happy Writing. You’re right, Diana. It is like an addiction. Having a pen in hand or hands on the keyboard is the fix! ❤ Even if I'm working on something book related, it helps. Happy Writing to you. Amen! When I worked, I used to spend my break time writing. Or when I worked at the school and couldn’t write at night, as soon as that job ended, I wrote for 3 days, practically non-stop. I get it, Kenzie! 🙂 I worked in a school and did the same thing. I couldn’t wait for summer and holiday vacations so I could write. Have a great weekend. Oh, Mary, I hope your back and hip heal quickly!